My love for vintage typewriters began on a cross country move from Louisiana to Oregon with my best friend Nicole in 1999. I found my very first writing machine at an antique store + gas station in the middle of nowhere. Kansas maybe? Since that day, I have collected over 15 of them! I always look for them at thrift stores, disguised by their little plaid-covered + leather-bound boxy cases, usually neglected amongst all of the ink-jet printers, radios, and tools. Some are plain, some are broken, and some are rare. My Hermes 3000 is like no other and I cherish it everyday! I found this minty green beauty at a thrift store in Portland. I always check to make sure all the keys strike and the action is good. For some reason, there was a stack of loose leaf paper hanging out, so I decided to load the machine with a piece and type away. I wasn't really paying attention in my frenzy to get all of the letters, numbers, and symbols onto the paper, but as Nate hung over my shoulder, he pointed out that everything I had just typed was in cursive. I immediately went into shock, and then when I realized what I was about to take home with me, I felt extremely lucky and thankful. I shouted softly, Nate! It's cursive! One of my dreams came true that day! 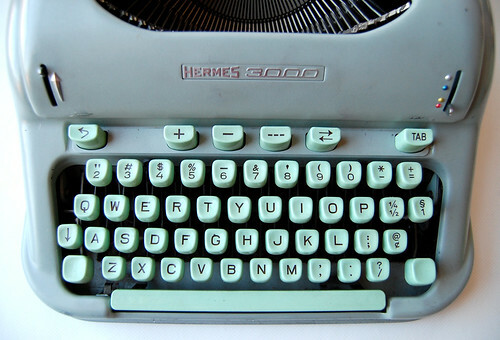 Most of our typewriters are on display, simply as decoration, but the Hermes 3000 gets a workout. When I started making Giant Dwarf crafts, and setting them free into the world, I decided each piece needed some sort of label or tag for identification purposes. I'm not much on labels or branding, but in the handmade world, I believe it to be of the utmost importance. I thought about buying woven or printed labels, and then a wonderous idea surfaced! What if I could use the pretty typed font from my typewriter to create all of my labels with? It was worth a shot, at least! I took creamy white grosgrain ribbon and stuck it inside my typewriter to see if it would take the ink. It worked! I had found an alternative to label making. Yes, that's right, all of the Giant Dwarf labels are typed by hand, and true to the nature of my company, are all one-of-a-kind. 1. Measure + cut your ribbon to the length desired to fit onto your loose leaf paper. 2. Lightly spray the loose leaf paper with spray adhesive. I use Elmer's Mulit-Purpose Spray Adhesive, but any other brand will do. 3. Let the glue become tacky and place your ribbon onto the paper, using the lines as a guide. This will help to keep things nice + neat when you are typing. 4. 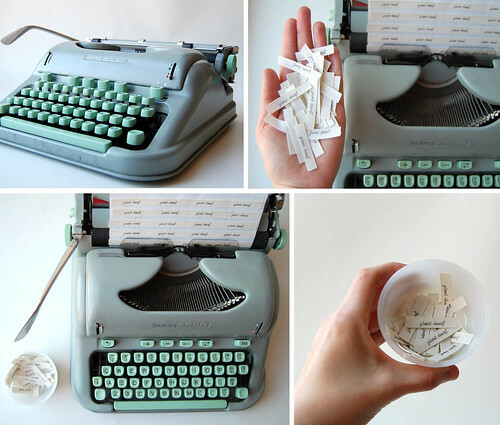 Feed the paper into your typewriter and type away. 5. Once you are all done typing, gently remove each strip of ribbon. It should peel away with ease, but sometimes, if the glue is too thick, the ribbon might come away with a paper souvenir. 6. Now that your text is typed onto the ribbon, you'll need to heat-set the ink. Set your iron to the polyester or synthetic setting. 7. Sandwich the ribbon in between the piece of scrap fabric or press cloth, protecting your iron + ironing board from a sticky situation, and iron for 30 seconds or so. Be careful as those strips will be hot! 8. 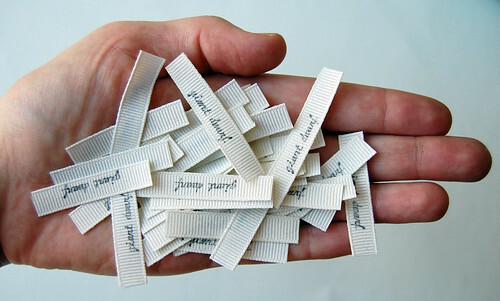 Take your lovely labels and do with them whatever you wish! Please note! Due to the spray adhesive, some damage may be done to your typewriter. If you are fond of your machine, I would suggest using a junker from a thrift store to play with first! Making labels by hand does take quite a bit of time, but attention to detail means so much to me. I know there are quicker ways of manufacturing such a thing, but I feel like I'm living up to the true meaning of handmade! I am ridiculously jealous of your cursive typewriter...they seem to be rare! Oh my goodness - I am unspeakably jealous! Yes every time I look at something created with a typewriter I experience strong sensory flashback of the sound and two finger poking action! Where do you purchase your new ribbons for your Hermes 3000? I am still searching for a cursive typewriter! I see them on ebay sometimes, but I never win. yours is a beauty! I love these labels! So amazing! **gasp** a cursive typewriter! i didn't even know these existed... i should post about my typewriter, which isn't half as nice, but it was found in the trash and had the text, "good things come in small packages" taped on it....thanks for sharing this! thank you for sharing this. i have been wondering how to approach this but i also think it's the small details that can make your pieces stand out. congrats on the anthro deal! That's such a great idea. This whole time I have been printing out my shop name on tags to LOOK like a type writer..ha. I will continue my scouring of antique shops in the hopes of finding a piece of treasure! Hello Sue! Allow me to introduce myself...my name's Erin but we have a third degree connection. I'm the significant other of Polly Conways brother Michael Conway! She told me about your deal with Anthropologie so I checked out your blog. I'm looking to purchase a Hermes 3000 myself but had a question I was hoping you could answer: can you buy new ink cartridges for it? And if so, where? I also have a cursive typewriter that I absolutely adore. Mine gets used to make reclaimed paper pins and, in the future (but before Crafty Bastards) hopefully some cute stationery. I had no idea you could type on fabric -- GENIUS. wow! thanks. yours look great! a friend of mine purchased one of your lovely headbands at renegade in brooklyn. she gets lots of compliments, so your attention to detail is well worth it! love your blog and will continue sharing it with others! thanks for the inspiration. I do a lot of things on my old typewriter - I love it - but I didn't even know that cursive typewriters exist! I'm so jealous!